PNe offer important insights into the time scales and mechanism of AGB mass loss and provide key observational tests of late stellar evolution and nucleosynthesis. However, traditional optical emission line detection techniques, struggle to cope with extinction, particularly in the Galactic Plane. We are using longer wavelength emission, such as from the ro-vibrational lines of molecular hydrogen, to detect optically-obscured objects leading to a more representative sample of PNe throughout the Galaxy. PN candidates seen in molecular hydrogen emission at 2.122 microns, but not visible in h-alpha or optical broadband images. Field of view is 1 arcmin. It is still unclear whether single stars can form PNe or if a binary interaction is required. We use a variety of observational and modelling techniques to study the evolution of stars from the AGB, through the post-AGB and PN-formation stages, including the point at which the PN "switches on". Our goal is to understand the origin of the discs, outflows and jets seen in post-AGB objects, their role in PN formation and shaping, the timescales involved and the range of progenitors that can lead to observable PNe. A very young PN showing both molecular emission from the 1-0 S(1) transition of H2 as well as recombination emission from the developing photoionization region in the centre. The aim of the SPY survey (ESO SN Ia Progenitor surveY - SPY) is to observe more than 1000 white dwarfs brighter than V=16.5mag to perform a statistically significant test of the double-degenerate (DD) scenario. 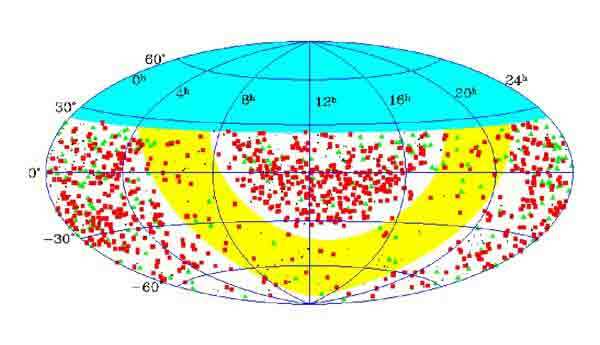 Stars observed during the survey observations are shown in the map (figure below). Distribution of all known white dwarfs south of a declination of +25 degrees and brighter than V=16.5. Red squares and green triangles indicate white dwarfs observed by SPY. Black dots are the remaining objects without a SPY observation. The yellow band indicates the position of the Galactic disk. We used the SPY sample to constrain the contribution of halo white dwarfs to the mass of the Milky Way. We have now determined the population membership of 400 white dwarfs from the SPY sample using the UV diagram described in the figure above. 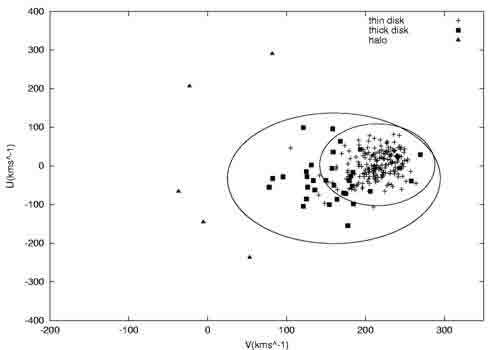 The result is that 7% belong to the thick disk, 2% to the halo populations, the others are members of the thin disk. When computing the mass contributions one has to take into account that the volume inhabited by thick disc and halo white dwarfs is much larger than that of the thin disc. After correcting for this the contribution of the thick disc and halo white dwarfs become comparable to the thin disk, larger than thought previously. However, even so the combined contribution of all white dwarfs to the mass of the Milky Way is only modest. UV diagram for main sequence stars. The velocities U, V and W describe the galactocentric velocities of stars. U: velocity component pointing in the direction of the galactic centre, V: component in the direction of galactic rotation, W: velocity perpendicular to the galactic disc. For main sequence stars the population membership can be inferred from an analysis of their chemical abundances. This is not possible for white dwarfs, because their surface abundances are strongly altered due to their very high surface gravity. Thus we use the position in the UV diagram calibrated with main sequence stars to determine their population membership. The smaller ellipse include the position of thin disc stars, the larger one that of thick disc stars. Stars outside the thick disc ellipse belong to the galactic halo. Most stars reside in binaries. Thus it is not surprising that some white dwarfs have main sequence companions. Since a bright main sequence star outshines a white dwarf, it is easiest to find binaries consisting of a white dwarf and a low mass main sequence star (spectral type M) or a brown dwarf. Some of these systems are close binaries with periods of only a few hours to a few days. This phase of binary evolution, possibly involving a common envelope, is only poorly understood and empirical data, like the period distribution, is important to improve our understanding. Wide binaries are important as benchmark systems. It is very difficult to determine the age of low-mass stars or brown dwarfs. A white dwarf companion can help. It is straightforward to calculate the cooling age (the time since the formation of the white dwarf) once the temperature and mass of the white dwarf has been determined. This can be supplemented by an estimate of the main sequence lifetime of the progenitor to derive the total age of the white dwarf and its companion. The SPY project discovered some 40 new white dwarf+main sequence binaries. Twenty of those show radial velocity variations indicating a short orbital period. This sample is very useful to investigate the effects of close binary evolution. Many more white dwarf binaries will be discovered in ongoing optical and infrared photometric surveys.